LAWRENCE — A University of Kansas School of Law team was crowned as the national champion of this year’s National Native American Law Students Association Moot Court Competition. 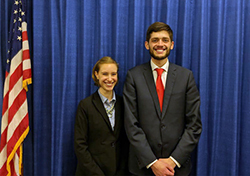 Chris Carey, of Westwood Hills, and Maria Drouhard, of Green Bay, Wisconsin, defeated Columbia Law School in the final round of the competition March 2 in Tucson, Arizona. Carey also received the G. William Rice Best Oralist Award. “Competing in the NNALSA Moot Court Competition has been such a rewarding experience,” Drouhard said. “I’ve learned so much from our coaches and other team members. Chris and I have worked as a team for three semesters. It was exciting to see all our hard work and growth rewarded with a win." This is the fourth time in the past five years that KU Law has advanced to the final round of the NNALSA competition. KU Law teams brought home the national championship in 2016 and second-place finishes in 2015 and 2017. The NNALSA competition tests students’ knowledge of Indian law by evaluating their legal writing and oral advocacy skills. Students submit written briefs and participate in a simulated courtroom experience. KU Law brought four moot court teams to the competition, and all four teams competed in the Sweet 16 round. In addition to Carey and Drouhard’s first-place finish, third-year law students Dan Kopp, of Belvidere, Illinois, and Nancy Musick, of Topeka, finished third overall in the competition and received an award for the second best brief. Two additional KU teams competed at the event, including Austyn Caisse, of Santa Cruz, California, and Lindsie Ford of Edmond, Oklahoma, as well as Brodie Herrman, of Manhattan, and Adam Lauridsen, of Lawrence. The final rounds were judged by a panel of esteemed Indian law scholars and practitioners, including a circuit court judge for the U.S. Court of Appeals for the Ninth Circuit. “The students’ success at the competition speaks volumes to their intelligence and dedication as well as to the commitment of KU Law faculty and staff to prepare students for this level of competition,” Kronk Warner said.